I honestly don’t know why it took me so long to make these. I clipped the recipe from a Dan Lepard column in the Guardian some time ago and dutifully stored it away, where I repeatedly came across it in subsequent weeks, swearing every single time that I would make it if not that day, then the next. And so it went on, despite the fact that flapjack is one of the quickest routes to teatime satisfaction, despite the fact that I always have all of the ingredients in my cupboards, despite the fact that I’m pretty sure my face lit up like a kid at an ice-cream van every time I passed over the words ‘halva flapjack’. The halva bit, you see, refers to tahini, one of my favouritest things. I even wrote a whole post on the subject way back here. Dan says that the fudginess-making qualities of tahini mean that you can reduce the butter content of these flapjacks without them falling apart, which is surely a good thing; I’m not sure the condensed milk doesn’t slightly offset that health benefit, but I would never argue with the inclusion of condensed milk (another one of my favourite things! Which I particularly enjoyed here and here and here. Oh yeah, and here). 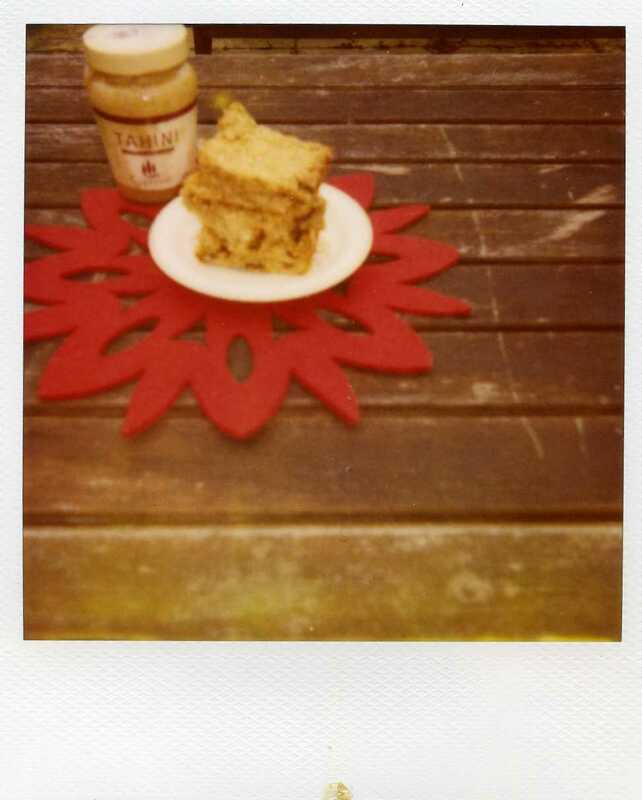 The only real changes I made to Dan’s original recipe were to up the amount of oats, which I felt was called for to even begin to make a substantial enough flapjack, and to reduce the walnuts because I know a lot of people who are not so keen on nuts in their cakes. Heat the butter, sugar and condensed milk in a saucepan until the sugar dissolves and the mixture is hot. Take off the heat and stir in the tahini and honey, then the dried fruit, walnuts and sesame seeds. Stir in the oats and mix thoroughly. Heat the oven to 180c,or 160c for a fan oven. Butter your smallest cake tin – Dan says 20-25cm square, but I think 20cm is definitely better for thickness. Pack in the flapjack mixture, spreading it evenly and pressing down with the back of a wooden spoon. Bake the flapjack for 15-20 minutes, until golden brown on top. Leave to cool before cutting, or it’s more likely to fall apart. These ones are good. And I know that 99.9% of chocolate chip cookies are good, but these are different – grown-up and interesting, like the chic mother of the ones you buy in paper bags from supermarket bakery sections. Not that they look exactly chic, in fact, they look exactly like any other big, lumpy round chocolatey cookie (i.e., I had to practice some serious distraction tactics not to eat them all as soon as they came out of the oven). But within the cakey interior lies deep, dark chocolate and a subtle, intriguing bittersweetness from the combination of treacly sugar and wholemeal flour. The recipe comes from Kim Boyce’s ‘Good to the Grain’, which I’ve mentioned before, and may well again. In the introduction to this recipe, she says “It’s surprising just how delicious this whole-wheat version of an old classic is. 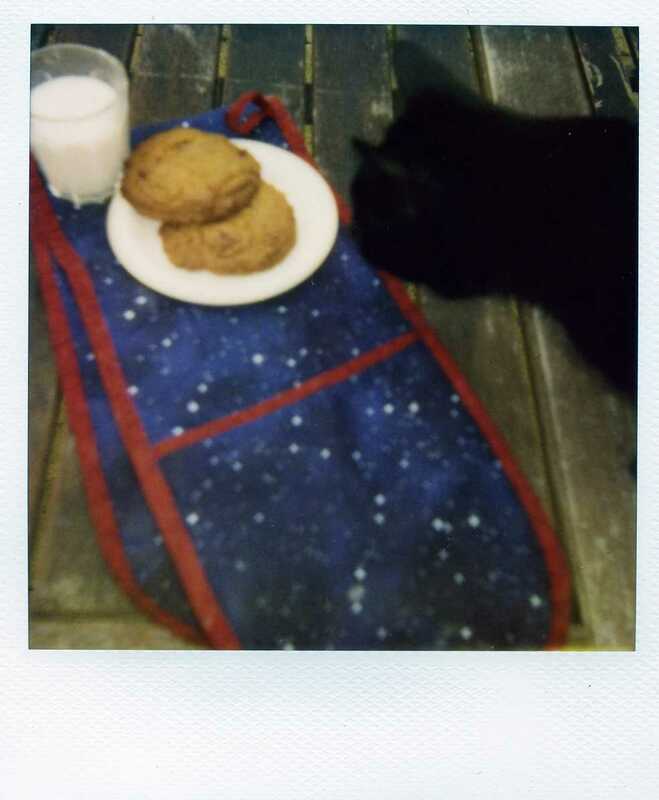 Unlike many of the recipes in this book, this cookie is made with 100 percent whole-wheat flour, which gives it a distinctive, nutty taste.” In any other book, I’d read that sentence and think, ‘so – they’re going to taste weird, then’ but I knew I could trust Kim to deliver, plus, I’d read good things about this cookie on Orangette (reading this post again, her description of it as a cross between a chocolate chip cookie and a digestive is spot on). 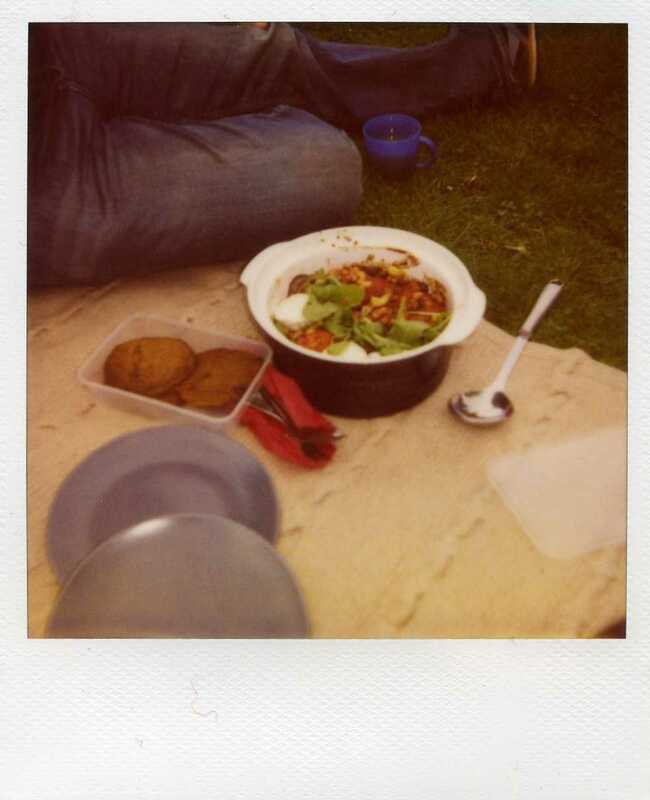 We took them on our first picnic of the year, where we ate them in the waning sunlight with homemade lemonade, fending off a group of large greyhounds. Ah, April, you have been good to us. I’ve rejigged the recipe slightly so it’s suitable for those of us unfortunate enough not to own a mixer. I also converted the measurements from American cup measures to grams – hey, you’re welcome – and I’m pretty sure I reduced the sugar somewhat in doing so; they were still sweet enough even for Tom, though you could always add a bit more regular sugar if you prefer. Preheat the oven to 180c and place the racks in the upper and lower thirds. Either line two (or more, depending on size) baking trays with greaseproof paper, or just butter them – I didn’t find that they stuck without paper. Cream the butter and sugars together – you don’t need to be too thorough, they just need to amalgamate. Add the eggs one at a time, mixing after each. Mix in the vanilla. Sieve in the flour, baking powder, baking soda and salt (leave out the salt if you only had salted butter), but tip back into the bowl afterwards any bits of bran etc. left in the sieve. Roughly chop the chocolate into chunks and stir in. Tip the batter out onto a work surface and use your hands to make sure all of the ingredients are fully incorporated (was this strictly necessary? It meant that instead of scraping out the bowl, I was scraping bits of dough off the worktop to eat, which is a bit less dignified, but I’ll leave that up to you). Scoop mounds of dough of about 3 tbsp onto the baking trays (I used an ice-cream scoop). Flatten them slightly or not, depending on how thick you want the end result to be. You want no more than 6 cookies to an average sized tray, as they spread a bit. Bake the cookies for 16-20 minutes (Kim is precise! Mine took 16) until firmish and darkened at the edges. Transfer to a wire rack to cool. “Why does your house always smell of Indian food?” Last week, I had lunch with my mum and introduced her to miso soup. In return, dropping me off, she made this bold generalisation about the culinary aromas that linger in our small (and inadequately ventilated) flat. She later conceded that it might not be entirely true, but then I do like to cook Indian food. I like to listen for mustard seeds popping in hot oil. I like the smell of coriander seeds ground in a mortar. I like the expectation that builds as the layers of spice and ginger and garlic and chilli meld and settle. And I really like discovering new, untried dishes which turn out to be so delicious you wish you had made twice as much. This was translated in the book I got it from as ‘aubergine and peanut mash’, which is accurate enough, but I think ‘bharta’ is a nicer word than ‘mash’, and doesn’t make you think automatically of sausages. Before you, um, bharta the aubergines, you smoke them – the technique is probably familiar to you if you own either of the Ottolenghi books or want to, but to sum up: remove the top bits of your hob, i.e. the trivet/rack that the pans sit on, and one of the circular metal bits that goes over the flame. Cover the exposed hob plate with foil, poking a little hole in the middle, and replace the round metal thingy on top. Turn the hob on and hold the aubergine over the gas flame until it starts to blister and blacken, turning occasionally (tongs help here) until it’s burned all over and starting to flop and collapse, indicating that the flesh is cooked through and soft. Leave until cool enough to handle and then peel off the skin and roughly mash the insides with a fork. This is extremely useful for making baba ghanoush and other tasty things. Prepare the aubergine as described above. Heat the oil in a saucepan and fry the cumin seeds until they start to darken. Add the onion and fry until soft. Add the ginger-garlic paste and chilli and fry for a minute. Add the tomato puree, turmeric and coriander and cook for a couple more minutes. Season to taste. Stir in the aubergine and peanuts, sprinkle with the coriander and serve with a lemon wedge.